Excelta General Tools & Instruments Co. 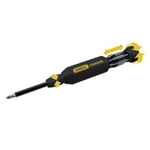 Features nine hardened and tempered punches and a self-centering steel mandrel. 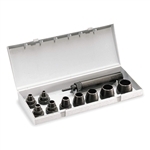 The interchangeable punches are threaded for a tight, secure fit to the mandrel while in use. The entire set is packaged in a fitted plastic case for storage. The 170 LX is a remarkable advancement in cutter design. Carefully crafted precision cutting blades combine seamlessly with curved, palm shaped, handles to deliver effortless lead cutting and user comfort.